Knowing which items to splurge on and which ones you can get away with buying on the cheap can help you pull off a polished look without breaking the bank. Generally, classic pieces that stand the test of time are worth the investment. Trendier styles tend to be fleeting, so it’s smart to pinch pennies on these puppies. See what you should save and splurge on. Tailoring details, fit and fabrication all combine to make a quality dress shirt worth the splurge. Whether you go more formal with a dress pant and blazer or keep it casual with dark-wash denim, you’ll looked polished and put together. When it comes to jeans, you get what you pay for. Premium jeans are carefully crafted using quality denim fabric and authentic-looking washes. Most importantly, you get a great fit that stays that way and accents your best assets–no bagging, sagging and stretching out. Same goes for a premium denim shirt. Splurge on this staple, and you’ll have it for years to come. Shirt styles change constantly. Colors that are popular one season are out the next. 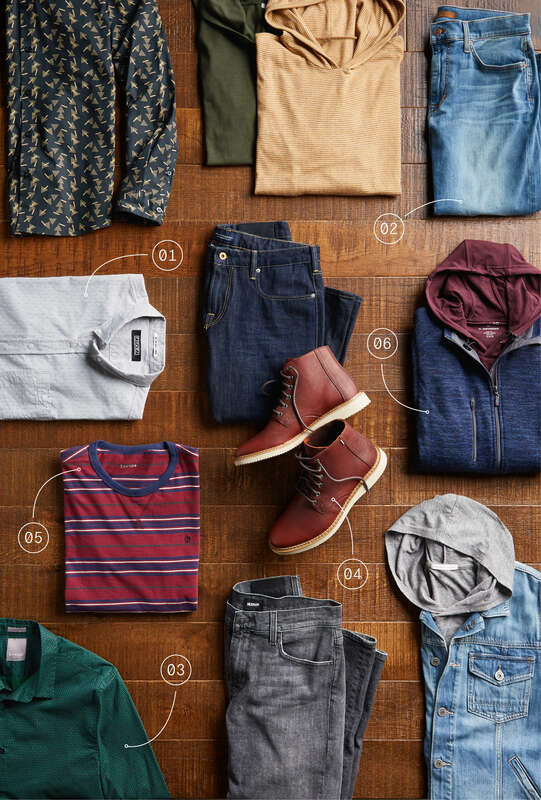 Pick a few styles and patterns and mix and match them with what you already have in your closet. It’s an easy way to update your style without blowing your budget. They say you can tell a lot about a man by the shoes he wears. A quality pair of shoes or boots will take you far–literally. Thanks to the well-designed arch support and extra cushioning in higher end brands, you can say goodbye to blisters and calluses. Luxury materials, such as high-grade leather last longer, look better and can elevate the rest of your look. Yes, these fine soles are worth the splurge. These easy-going, everyday basics come in a variety of colors, patterns and comfy styles. Since they tend to be wardrobe staples that can go easily from one season to the next, you really shouldn’t have to spend a lot to buy a high-quality knit shirt. Outerwear with built-in functionality (think zippered vents, breathable, water-wicking materials, handy hoods) will give you more bang for your buck, but you may have to shell out more bucks than you would if you went with a less utilitarian version. Splurge, and you’ll be able to handle whatever weather comes your way. To get the perfect mix of high/low items in your Fix, be sure to update your Style Profile with your pricing preferences.